The flesh of the tuna can range from very light pink (nearly white) to deep reddish brown, depending on the variety. Prime raw tuna steaks look very much like raw beef, right down to the deep red color of the flesh. The tuna steak may have a darker brown area, which is edible but has a much stronger flavor. Sometimes this is already trimmed away by the fishmonger. Fresh tuna is usually sold already skinned since the skin is extremely tough. 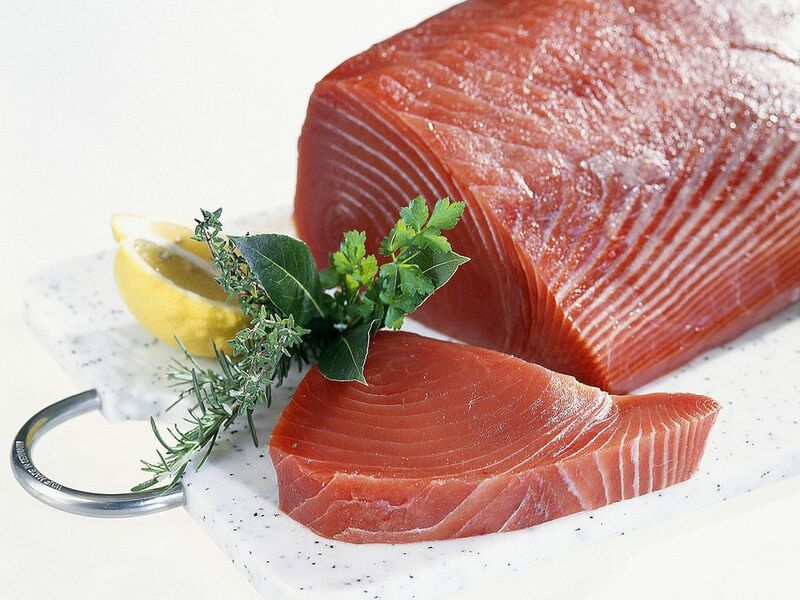 When selecting fresh tuna, avoid any with dry or brown spots (other than the natural darker brown area). There should be no rainbow sheen on the fish, and it should smell ocean-fresh. The fishmonger generally keeps the tuna in a large filet, which looks very much like a beef loin, and will slice off what you need. Fresh tuna season runs from late spring to early fall, but frozen steaks are available year-round. If you have the option, skip the thawed frozen filets and buy the tuna filet frozen. This way, you know it will be the freshest possible because you control when to thaw it. Just be sure to store it in the coldest part of your freezer until you are ready to thaw it. Get that raw tuna home from the market and into your refrigerator as soon as possible. Keep the tuna refrigerated until you are ready to use it. It is best to use fresh tuna the day of purchase. If you need to store it, pat it dry, wrap securely in plastic wrap or foil and store in the coldest part of your refrigerator (optimum temperature of 31 degrees F.). If your refrigerator is not that cold, place the wrapped fish on a bed of ice or in a plastic bag filled with ice. Use within 24 hours. If you know the tuna is fresh and not previously frozen, feel free to wrap and freeze it. However, if you're buying fresh tuna in a grocery store, you can almost bet it has been previously frozen, in which case it is best to use it immediately. To freeze fresh tuna, prepare a solution of 1 tablespoon ascorbic acid crystals to 1 quart of water or 1/4 cup salt dissolved in 1 quart of water. Dip the fish into the solution to firm it up. Seal in plastic wrap and then in a zip-top bag. Better yet, freeze it in an ice block by putting into a zip-top bag and covering with water. Squeeze out all the air and seal the bag. Freeze up to three months. Thaw frozen tuna slowly in the refrigerator. If it is in a sealed zip-top bag, it can be thawed more quickly by placing the sealed package in a sink or pot of cold water. Microwave thawing is not recommended. Cooked fish will keep three to four days in the refrigerator. Leftover cooked tuna is excellent as a salad topper. Reheating is not recommended unless you chop and add gently at the end of a cream sauce until just warmed through. Serve over rice or pasta. Whole chunks of smoked tuna will last up to ten days in the refrigerator. Be sure it is always kept tightly wrapped. Smoked tuna chunks can be wrapped and frozen up to two months, but be aware that there may be some loss of texture when thawed. You will have many varieties and grades of canned tuna from which to choose. Your selection will depend on your tastes and the specific recipe used. Solid or fancy pack will contain large pieces of tuna and is usually albacore. Only albacore tuna may be labeled and sold as white tuna. Many will pay the higher price for white tuna because it has a milder flavor and lighter color. In fact, it looks very much like canned chunk chicken and can be substituted for canned chicken in many recipes. Chunk tuna has smaller pieces. Flaked tuna is fairly broken apart and best used for salads where the tuna is mashed and mixed anyway. Canned tuna is usually packed in water or oil, with the oil-packed being more flavorful and moist. The latest commercial innovation is tuna packed in vacuum pouches with no added oil or water. Unopened canned tuna can be stored in a cool cupboard for up to 1 year. Place leftover canned tuna in a sealed container in the refrigerator and use with four days. Tuna salad with a dressing can be refrigerated up to three days. Cooked tuna dishes such as casseroles can be frozen up to 2 months.